2017 marks the centenary of Imperial War Museums (IWM) and 100 years since work began to create RAF Duxford. This landmark occasion has been commemorated with the creation of DX17*, Duxford’s first ever contemporary art installation. DX17 will be revealed to the public on Friday 16 June. Inspired by themes of flight and innovation, DX17 is a dramatic large-scale sculpture, similar in size to a Spitfire, futuristic and aerodynamic in form. It has been created by BAFTA award-winning multi- disciplinary artist Nick Ryan whose previous projects have included Tate Sensorium, an immersive multi- sensory exhibition at Tate Britain and A Living River, the world’s largest brand sound installation, currently on display at Gatwick Airport. 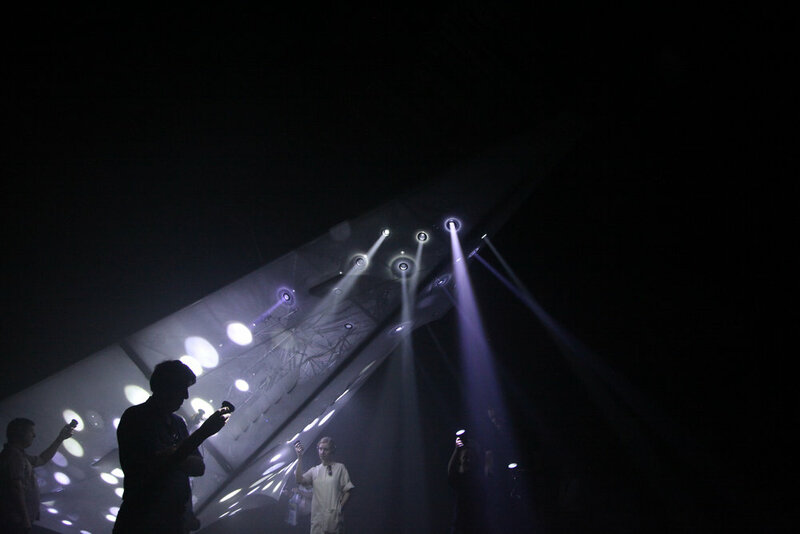 DX17 is presented in a dramatic darkened space providing an immersive experience for visitors. 100 bright lights are emitted by the sculpture, each representing one of one hundred discoverable ‘memories’. 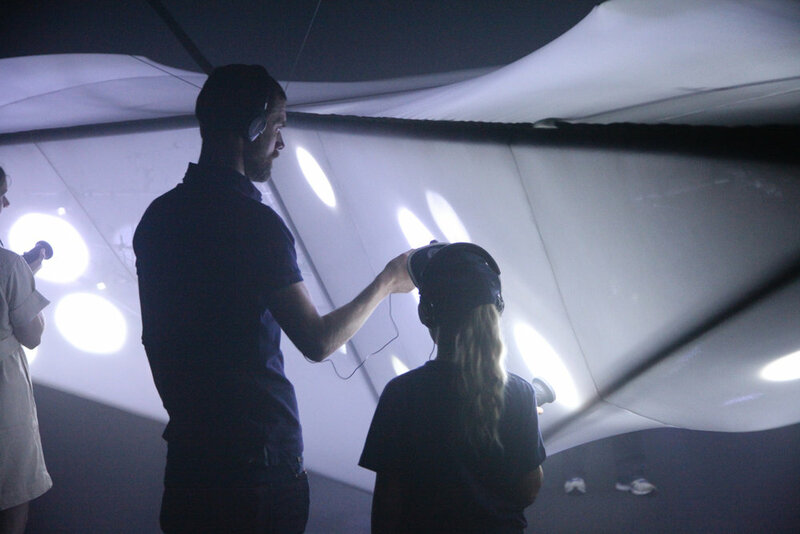 Holding a receiver in the palm of one hand, the visitor can scan the device over the surface of the sculpture and magically transform these points of light into sound, effectively ‘tuning in’ to the sound of up to 100 voices. A further sound system surrounds the sculpture providing a cinematic soundscape in which elements received through the headphones are dramatised around the listener. Sounds featured in the soundscape include Morse Code messages that reference the sculpture’s name, fragments of historically significant music and original ambisonic recordings of a Spitfire performing a high speed, low altitude manoeuvre known as a 'run and break’, captured by Ryan at Duxford especially for the project. The title DX17 references the centenary narrative (1917-2017). DX was also the airfield identification code for Duxford during the Second World War. It forms part of the Airfield Signal Square, visible from high above in the sky. The two consonants are quickly interpreted as a synonym for the museum and the airfield. DX as a verb describes the activity of listening in on long distance (short wave) radio linking the radiophonic narrative of the installation and the aural connection it provides to the long-distant past. A novel new technology has been engineered for the project by mechatronic engineer Sean Malikides that allows audio to be encoded into the 100 light sources and then decoded by a receiver into audible signals. analogue electronic transmitter and receiver circuit that makes it possible to transmit speech through the light beams that illuminate DX17’s surface and enable people to decode the signals as sound with a battery-powered handheld device. Ryan collaborated with design studio Kin and designer/engineer Tom Cecil to develop DX17’s sculptural form. Taking the size of a Spitfire as a reference of scale, the team designed a10m x 6m aluminium spaceframe structure with a 3D mesh fabric covering. A selection of recognisable aerodynamic shapes (winglets of a Eurofighter Typhoon, the exhaust manifold of the Spitfire) found in aircraft in Duxford’s collection evolve DX17’s basic delta into a hybridised shape that is both evocative and futuristic. DX17 was hand -built by Tom Cecil (by coincidence the grandson of Wing Commander Rupert Cecil) and Kin in Tom Cecil’s workshop in Leyton. Ryan also collaborated with Kin to design the receiver object that holds the receiver electronics and is used by visitors to decode light into sound. The receiver’s form is inspired by various metallic, leather and Bakelite objects found in vintage aircraft including avionics, pilot oxygen masks and headsets and are manufactured using 3d printing technology. Kin project managed and produced the project and, alongside Tom Cecil and his team, installed the sculpture inside a purpose-built structure on the hanger base at Duxford. DX17 was created with the generous support of Bowers & Wilkins. The installation uses 14 x Bowers and Wilkins 685 S2 loudspeakers and its P5 Series 2 model headphones. DX17 was also generously supported by MOTU whose AVB system is used to distribute audio to the sculpture. DX17 will be open to the public from Friday 16 June and the experience is included in general admission to IWM Duxford.